Now the experimental Hip Hop squat travels to Vienna to take all lovers of heavy beat science by assault. 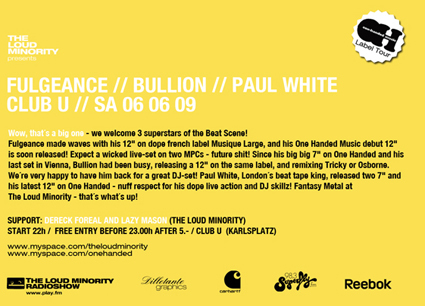 Beside the labelmates Bullion and Paul White, who will DJ, also Fulgeance is invited. The French producer, that will soon release his One-Handed Music debut, already create a stir with Jazz influenced dope beats on the Parisian Musique Large label. In Austria he is armed with two MPCs too envisage his sound live.